MONTVALE, N.J., Sept. 4, 2018 /PRNewswire/ -- Sharp Imaging and Information Company of America (SIICA), a division of Sharp Electronics Corporation (SEC), is excited to announce its first-generation 8K Ultra HD 70" Class (69.5" diagonal) LCD monitor, the 8M-B70AU. The dazzling display provides the ultimate in high definition, conforming to the 8K Ultra HD standard (7,680 x 4,320 pixels) and offering HDR (HLG/PQ) functionality, with a peak brightness of 1,000 nits. With more than 33 million pixels, it allows for pixel resolution 16 times greater than Full HD. While users who stand close to a Full HD monitor can distinguish individual pixels, the pixels on an 8K Ultra HD screen are not visible to the naked eye. This provides for images so realistic, and with such a sense of depth, that it feels as if objects aren't just on the screen, but are actually the real thing. Sharp's 8K Ultra HD technology vividly reproduces every last detail, beyond the perception of the human eye. In academic fields, it allows users to enlarge images of fine art, artifacts, or architectural structures, providing a close-up look at the intricate techniques used by its creators. Viewers are able to see details that would normally be invisible. 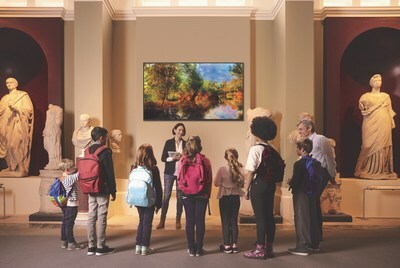 "We're proud to always be at the forefront of innovation in the display space and our 8K monitor continues that tradition, providing overwhelming realism for users," said Gary Bailer, Director of Product Planning and Marketing for Pro AV Products at Sharp Imaging and Information Company of America. "By upscaling from 4K to 8K, the 8M-B70AU has pixels so small that they provide a 3D-like image. It's like looking through a window." Sharp's 8M-B70AU delivers 10-bit color depth (1,024 shades), compared with HD's 8-bit color depth (256 shades), which improves color gradation. This means 8K UHD renders gradations with smooth, natural transitions between the various color shades. For example, 8K Ultra-HD could perfectly reproduce the previously hard-to-render colors and gradations of the sky. The 8K monitor is coming off a highly successful preview tour on this year's tradeshow circuit. At the National Association of Broadcasters (NAB) Show in April, it took home three Best of Show Awards from NewBay's Digital Video, TV Technology and Sound & Video Contractor. In addition, Sharp also won the RedShark News Best in Show award at NAB for its 8K technology overall and the work it does to promote the benefits of the 8K space. In June, the 8M-B70AU also took home a Best of Show award at InfoComm 2018 from AV Technology and the overall Best Flat Panel Display award from rAVe Publications.